While we may be currently wearing our little white dresses on repeat right now, a cool and crisp new season draws ever closer, which means it’s time to get ahead of the exciting new trends fall has in store for us sartorial devotees. In particular, the invigorating new season colors that will be huge come September. So what autumnal hues do we have to look forward to? We looked to the F/W 18 runways for fresh inspiration to see what designers exclaimed as the must-have colors of the season. While many shades conjured up images of pumpkin spice lattes and stomping through crunchy leaves (think earthy browns, olives, and rich burgundies), there were several unexpected choices that moved away from traditional trends in favor of more expressive tones (think yellows, oranges, and pinks)—colors guaranteed to pick us up on gray, cloudy days. Scroll below for the colors that will be huge for fall and shop our picks to get ahead of the trends. Unexpected—yes. 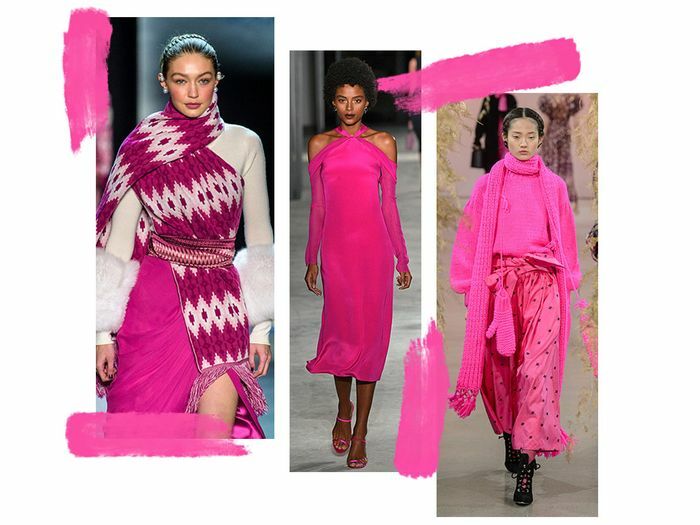 But we can't help but fall in love with the hot pink hue that saturated the F/W 18 runways. For a statement look, wear the bright and vivid hue from head to toe, or add it to your outfit in the form of a chunky scarf (à la Gigi Hadid at Prabal Gurung's show). Fashion girls have been quick to take on the trend—spotted in abundance at recent, Copenhagen Fashion Week. The color works really well with paired with neutrals: gray, black, camel, and white. Time to add some sparkle to your outfit this season. Shimmery metallics were glittering all over the runways. Whether you choose a dark liquid silver or light sparkling sequins, add the reflective fabric to your daytime outfit by pairing a glittery skirt with a casual white tee and sneakers, or turn heads at your next party in a striking silver dress. Available in sizes FR34 to 44. Nothing feels quite like fall than warm and rich autumnal brown hues—luckily there were plenty to go around, making an appearance in camel, rust, beige, cinnamon and chocolate tones. Brown may just be the new black. Pantone selected this as the color of the year in 2018. Designers showed off the rich and vibrant hue in the form of sweaters, scarves, and two-piece skirt sets. It's best paired with browns, reds, and pastel yellows. A bright and bold red will take you from fall into the holiday season in style. Designers such as Tibi, Jil Sander, and Prabal Gurung dressed models in the happy hue from head to toe. Invest in a beautiful red overcoat or dress, and have fun playing with volume and texture. While all types of blues reigned supreme on the runways, from pastels to navy, it was the dynamic shade of starry eyed-blue that really grabbed our attention this season. Wear the effervescent shade with crisp white boots or a contrasting (also very popular) orange hue. This color should be as rich and deep as the red wine you plan to enjoy on those cold and crisp fall nights. Pantone named the hue red pear for its deliciously luscious deep red shade. Play with fabrics and textures when wearing this color, such as a silky blouse or a deep velvet dress. Sure, the sunny color is more often associated with summer, but expect to see the bright hue continue its vibrance over the cooler months too. From pale and soft yellows to neons and spicier shades, wear the fun color with whites, grays, and pale blues, or contrast it with edgy black leather.